Cain & Abel 4.9.40 released , Download now ! 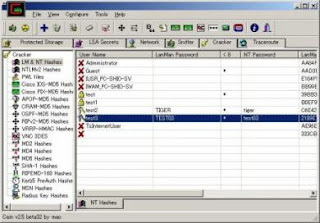 Cain & Abel is a password recovery tool for Microsoft operating systems.It allows easy recovery of various kind of passwords by sniffing the network, cracking encrypted passwords using dictionary and brute force attacks, decoding scrambled passwords, revealing password boxes, uncovering cached passwords and analyzing routing protocols. Added Proxy support for Cain's Certificate Collector. Added progress bar indicator in the off-line capture file function. Bug fixed in ProxyHTTPS Man-in-the-Middle Sniffer parsing "Connection Established" string. Bug fixed in VoIP Sniffer creating MP3 Mono files. Bug fixed in RTP Sniffer processing off-line capture files. WinRTGen recompiled with OpenSSL library version 0.9.8q.